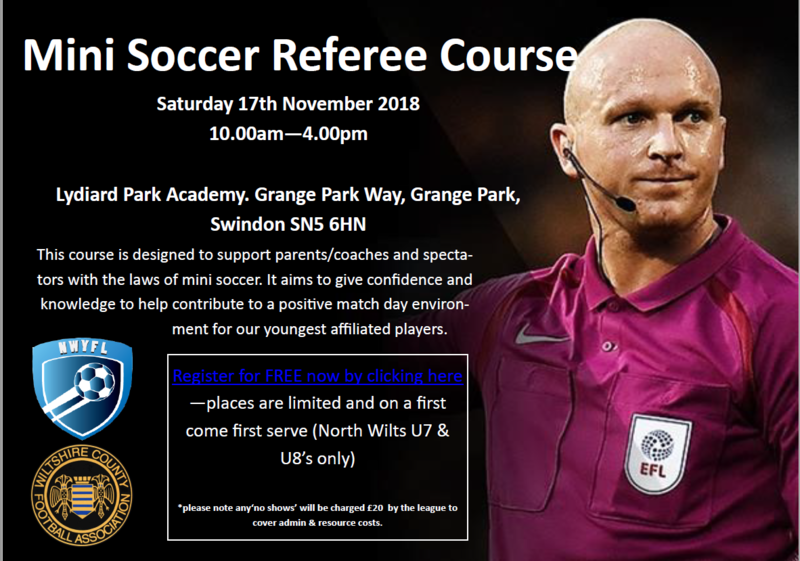 The NWYFL are running a free ‘Mini Soccer Referee’ course this Saturday (17th November) which is being held at Lydiard Park Academy (10am – 4pm). This course was created for teams competing at the U7 & U8 age groups and targeted at parents who could commit to be the appointed Referee for their team’s home matches. We currently have a few remaining spaces and therefore wish to open this up to any teams competing in the U7, U8, U9 & U10 age groups. Therefore, if any teams at these age groups have have parents willing to take the course, please ask them to Register via the link below in the advertisement. When completing their details, please ask attendees to specify which team and age they are associated too.